Wilma Johnson surfs her dreams. In her book ‘Surf Mama’, Wilma Johnson tells the story of how she left an Irish fishing village with her family to come and live in Guéthary and live her dream – to surf. To be honest, Wilma the artist wasn’t destined to become a ‘real’ surfer, the type who heads off in December in the rain to catch waves beach, and comes back with ice-cream head. If her slim figure, long hair and two dogs are now well-known around Guéthary, it’s the fulfillment of a woman’s destiny grasped by the horns. Her father was a francophile economist and writer, her mother a teacher. Wilma has a degree from the famous Central St. Martins College of Art in London, where she stubbornly took a stand for figurative art, a very unfashionable option in the 70s. Then after some naked body-paint happenings with the artist Grayson Perry, ( photos show both a lot of nerve and a rather slapdash quality of painting at the time), the artist left the London scene with a backpack to see the world. What a shock ! The violently coloured mexican paintings of Diego Rivera, and the more mystical work of Frida Kahlo, reinforced her love of full-blown figurative art , nourishing a style which now explodes into an array of Tahitian Goddesses, surfer women , and matriarchs. Back in England, Wilma met her future husband and the father of her three children, Nick Gammon, an artist and expert surfer who took her off to live in Baile na nGall, in Ireland. Watching Nick confronting the icy waves, Wilma started to dream of getting on a board herself. But, unlike the pubs in Ireland, the waves are not very welcoming, and without realizing it, Wilma became an ‘Earth Mother’. She stopped exhibiting, made cakes and admired from afar, sitting on the sand, while her husband and his friends surfed with the seals. After Spain and Portugal – Guéthary. Until three terrible winters dominated by icy rain, and roads turned to mud put an end to their Irish adventure. The whole family set off in a camper van on a tour of Southern Europe, in search of what northern Europeans, sick of taking cod liver oil six months a year, so desperately seek … the sun ! And when she reached Guéthary, after several months in Spain and Portugal, Wilma put down her bags. 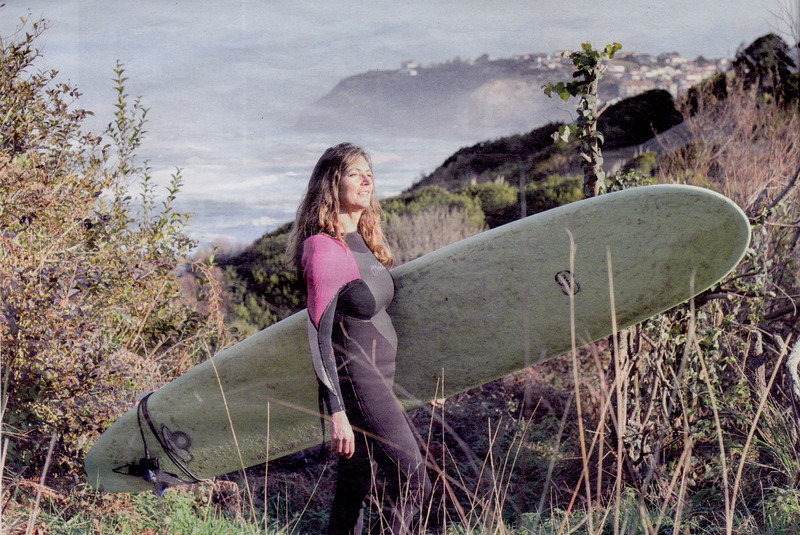 In her first book, Surf Mama, she tells the story of this rendez vous with the Pays Basque and her love affair with the waves with disarming honesty and very British self-deprecating humour. But in 2002, the year she arrived in Guethary, there were lots of male surfers in the water, and a few young women, but no mother figures. Wilma didn’t care, during an evening in a tapas bar, she swapped a painting for a board and headed out into the waves. Alone. With no teacher. But despite the friendliness of the local surfers, she couldn’t get anywhere with it. A year went by, then looking out from her bed over the wave at Parlementia- one of the most beautiful in the world – she made two decisions. She would leave her husband and get a coach. She created the Mamas surf club with Johanna, whose husband the surf champion Christophe Reinhardt became the coach. Wilma is instinctively a naturist and a feminist. So, in the Mamas surf club they were quick to confront to the burning issues. Her years in Guéthary have given Wilma some culture shocks – some violent. Like the day when Wilma realised that her children (Daisy, Nat and Alice) had learned at school that Waterloo was a tragic defeat. Or in the police station in Biarritz, when the Englishwoman almost fell off her chair seeing the police officers start their day by kissing each other. Sometimes, however the two cultures meet, like in France-England rugby matches. Then the family shares an irrational hatred of the English team with the rest of France…. 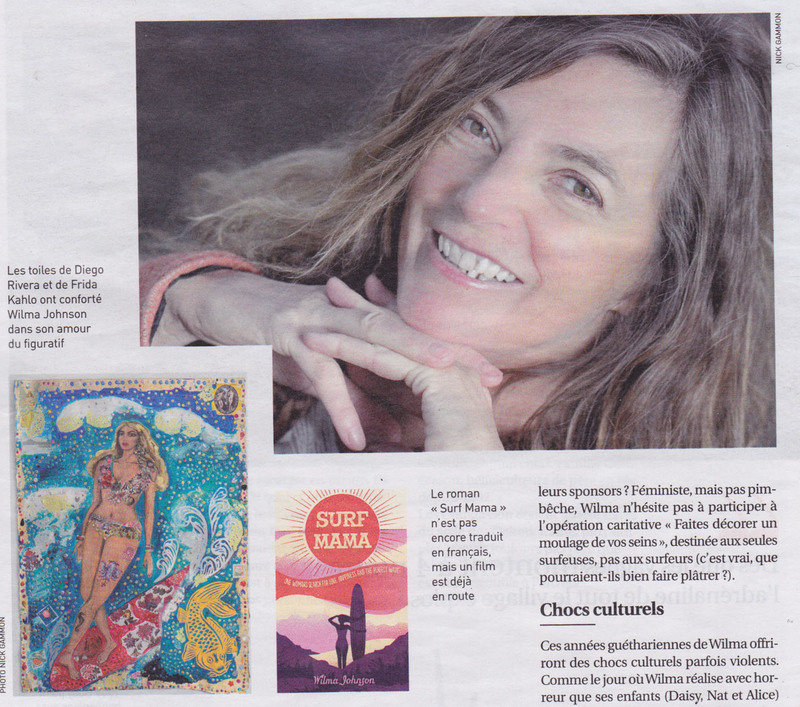 As yet, Surf Mama hasn’t been translated into french, but a scriptwriter living in Guéthary is finishing up a script for a film, rights have been sold to Powder Keg, a production company who found the book by chance. Since the book came out, Wilma and the Mamas have made a lot of progress. The pleasure they get and their addiction to the waves are stronger than ever. ‘When the waves get up to 4 metres, the whole village is buzzing with adrenaline, the ambience is amazing, its more than just a village of trendy Parisians ! To be in the ocean, bathed in the light, far from the land, that’s what I love’ she concludes. Born under the sign of Pisces – what else ?- Wilma now has three strings to her bow : she’s a painter, a surfer and a writer.